This year, as many of you know, has been a rough one. Since loosing my mother last December, this year has been fraught with things that remind us of our loss. Thanksgiving is definitely one of those days. It is difficult to look around at all you have and know that you want one more. Or to have the feelings that your children and family are so precious to you, but somehow it's just not enough. Not that I would ever stop loving my family or caring for my family, simply that I am acutely aware that someone is missing. It's one of the most painful things I have ever experienced. So, I must admit, I was more than a little afraid of this Thanksgiving. We decided not to travel for the holiday, and to go to dinner at my parents house. But, I was honestly afraid that they had invited half the neighborhood, which would mean, lots of people. I just wasn't really emotionally up for that. 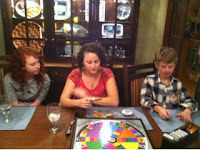 What a wonderful surprise our thanksgiving turned out to be! 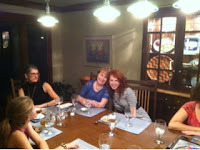 We had my parents, my children, my husband, my sister Ruth and our good friends, the Shapiros and their daughter Leah. Dinner, though not photographed, was AMAZING. So much love and friendship were in the dining room and it was so relaxed and just made the day much better than I expected. Below are a few of the pictures I took. 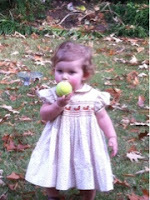 Don't forget to check out the cute picture of Lissy in my dress and the bloomers I made! I made a pair for each of the girls. MelissaJane wearing my dress that my mom made. Leah, Ruth and Jonas checking out the Trivial Pursuit Board. 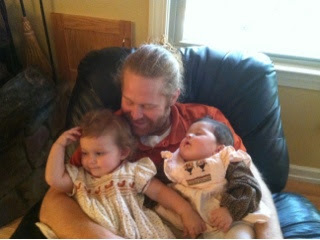 Geoff and the little girls both wearing dresses that my mom made. This will forever be one of my favorite photos of the three of them. 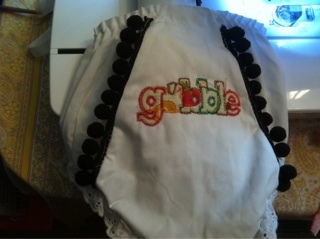 I had so much fun making these bloomers for each of the girls. It was great to get to see the Shapiros. The relationship Leah has with her mom reminds me of the relationship I had with my mother. 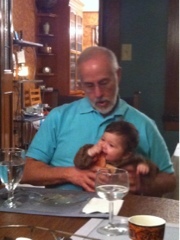 My dad and Dilly after Thanksgiving Dinner. He had great fun holding her. 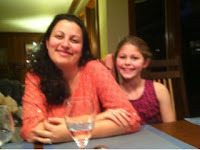 Me and My not so little, little girl. Time flies way to fast. Kiss and hug your babies, while they are small.